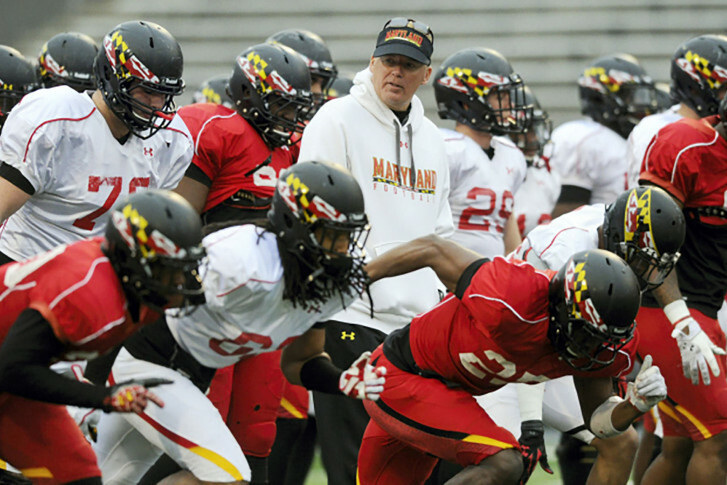 Maryland football coach Randy Edsall runs his team through preseason practice in April at Byrd Stadium in College Park. The university has approved beer to be sold at Byrd Stadium and other sporting venues this fall. Through his newly established nonprofit, Ben Page is bringing 500 young fans to Maryland's home opener against Temple on Saturday. COLLEGE PARK, Md. (AP) — A 2001 University of Maryland graduate wanted to get more fans in the stands for the team’s football games. So he decided to do something about it. Through his newly established nonprofit, Ben Page is bringing 500 young fans to Maryland’s home opener against Temple on Saturday. The youngsters are members of the Boys and Girls clubs in Prince George’s and Washington counties, as well as part of a sports organization in Queen Anne’s County. Page told The Baltimore Sun that his Old Line Tailgating Club has plans to bring in more young fans from youth organizations in Baltimore, Howard and Frederick counties to the Illinois game on Oct. 27. The club has raised $10,000 in its first 40 days with the help of nonmembers contributing to the club’s cause.